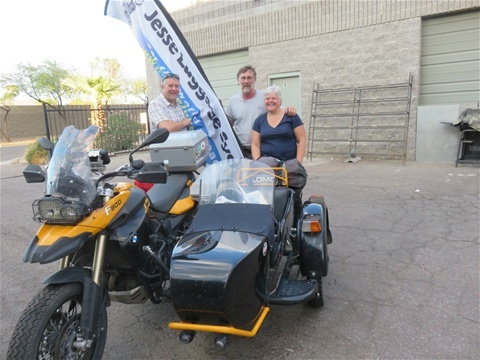 We had already arranged to head over to GO AZ Motorcycles sometime on Thursday to collect a new sidecar tyre, have it fitted plus another oil and filter change in preperation for next week and the road to Mexico. We had been told just to arrive anytime, and they would fit us in, so we headed over for about 11 am. It was right back over the other side of Phoenix, so we took the busy loop road, 101 around Phoenix to get there. It was ok, not too hot, about 27 degrees and quite overcast. When we arrived at the dealership, we were stunned by its sheer size! Apparently Scottsdale where it is located is an extremely wealthy part of Arizona, hence the dealership sold all kind of motorcycles: BMW’s, Urals (with sidecars), Kawasaki, KTM, Vespa’s. There were three huge buildings with a motorcycle training centre out the back and motorcycle simulators. It was truly like nothing we had ever seen before. There were endless staff working within the buildings, and during our three hours waiting for the work to be done, we had a good chat with a few. This included ‘Chappy’, a Chaplain, who we assumed now worked in Sales, who enjoyed telling us about his experiences when he was stationed in England as a Chaplain in the Navy, plus about his many trips down by motorcycle to Central America, to do ‘God’s Work’. Whilst we waited, a uniformed police officer was also having work done on his work bike (so he sat next to us, with his gun swinging from his hip- (’packing heat’- the term used when someone asked me the other day if I carried a gun!). All very interesting, and yet more of an interesting experience. Another favourite topic at the moment is Clinton v. Trump, and everyone has their opinions here on what is happening. Overall, the general consensus seems to be that the American folks don’t really want either one of them, and yet there is apparently more of a general interest than there has been for a long time in the election. We could, whilst we were idling our time away at Go Az have popped next door, and either a) renewed our wedding vows b) watched a film in the cinema or c) had a tattoo within the Harley Davidson store! That store was truly a megastore, with two storeys all the way around, and housing all those (very essential) extras. We knew Harley was a way of life here, but wow! Today we have been doing essentials, washing, haircuts, stocking up on bits and pieces that have run low, catching up with people. Paul has gone outside to change the spotlight bulb that blew on the sidecar the other day- oh, but hang on! When I have looked out of the window, Paul and another guy are both crouched down in front of the bike, and who is changing the bulb? Of course! The other guy, another new friend made, I’m guessing. We’ve also had a bit of time to reflect and had a brief look back through photos from the beginning of our journey, back in late June. The things we have seen, and done seem just unreal at times. We feel so lucky to experience this, and there’s more to come yet ……………. 28.09.16. 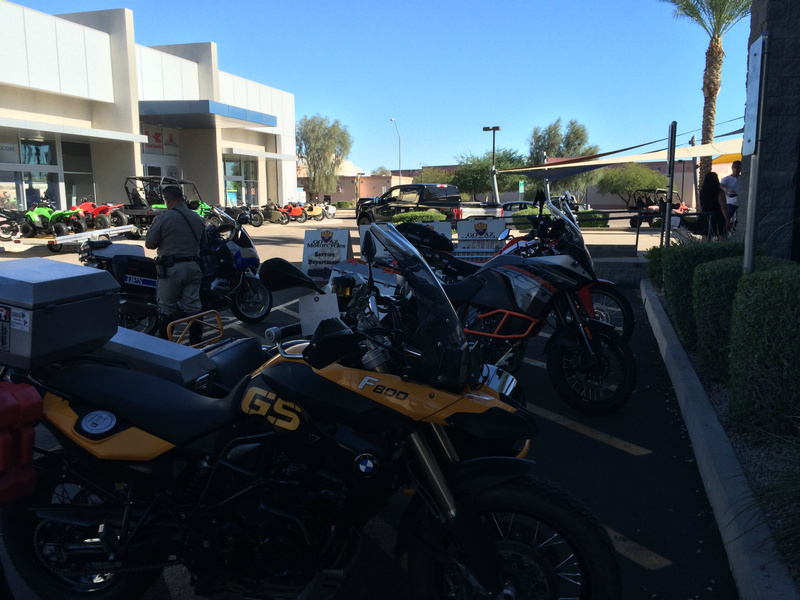 Flagstaff, Arizona to Buckeye, Arizona. Today we have celebrated our 100th day on the road! We have visited 22 American States, and stayed overnight in 21 of them. We have visited 10 National Parks in the US. We have ridden 15,000 miles. Before too long we shall be moving on to the next stage in Mexico, but for now……..
Today started off with rains in Flagstaff, pretty chilly around 10 degrees celsius, and increasing over the day to 39 degrees celsius at its peak. The first part of the day took us through tree lined roads which reminded us very much of home. Then we started to rise higher and higher until suddenly we turned a corner and were hit with a wall of heat. We arrived in the deserts of Phoenix, Arizona. It is, as you would imagine very hot, very dry but not very humid. Being a huge city, there is a massive grid system, and navigating the city was somewhat interesting! Yesterday, we had discovered when checking out some information regarding border crossings in Central America, that we had left a couple of vital documents behind. Both our Vaccination cards for Yellow Fever, and our Health Passports stating all the innoculations we have had were missing. As we shall need these when passing from one country to the next, especially if there is a prevalence of Yellow Fever in the preceding country, they are important! We didn’t quite understand how they had been forgotten, but these things happen, and so we set to making a plan of what to do now. Luckily, I had a good idea of where they had been left, and was able to ask my Mum to very kindly go and find them for us. Our good friend Alan will collect them tomorrow and send them in priority international mail for us to collect from a UPS store (which just happens to be opposite our hotel). This has only set us back a couple of days, which is lucky. So, with the scare of the missing documents looking like it was under control, we thought we’d take the extra time to head over to Glendale near Phoenix, and visit Jesse Luggage. Al Jesse makes the panniers that we have on our bike (and which I also had on my bike), and they are really wonderful. Al is a World Traveller who saw a need for a particular type of hardwearing, well designed luggage carriers, and so designed and made them himself. We were lucky enough to arrive and see Al and Kris, who works for Jesse, and who we had previously been in touch. Despite us not arriving until after 4pm, they made us very welcome. Al made a minor adjustment to our top box, whilst I chatted and laughed with Kris. Al then sat down with us and our map and very kindly took us through lots of good and useful information about Mexico, regarding where to cross the border, where is good to visit, drinking the water, staying safe, eating - that kind of thing. It was extremely good to hear positive, enthusiastic advice from someone who knows, and very much appreciated. To close for now, as we started the day celebrating 100 days on the road, and hoping for another wonderful 100 days to come. After the grandeur of the last two days, we thought it was impossible to top that. However, we left Mexican Hat in brilliant sunshine, after a Navajo breakfast (Burrito for Paul, strange omelette for me), and after 10 miles or so, we turned the corner to see the magnificent Monument Valley up ahead. To see something that you have only ever seen in photos or on tv before suddenly before your eyes can feel very overwhelming, and I felt I had to pinch myself just to be sure I was there. Mind you, when we were chugging up the hill to the monument behind a Minnie Winne (Bago), you soon bump back to reality. The plan for the day was going to take us to within 18 miles of the North Rim of the Grand Canyon, where we had at cabin booked at Kaibab Lodge. We were unsure during the day if we would try riding straight on to the canyon to try and catch sunset, or get up early and visit to see sunrise. It was to be a long ride today, 250 miles starting off chilly, but after we left the city of Page and turned towards Vermillion Cliffs on road 89a, the heat soared to 24 degrees very quickly. We were back into desert and Navajo country. Vermillion Cliffs soared into the sky above us, a deep red, and lined our route for many miles. Eventually on the 89a we reached Jacob’s Lake, with only another 25 miles to go to Kaibab Lodge. Jacob’s Lake stands at 7925 feet above sea level, and the weather was still warm and bright. Because of this we decided to go quickly along the last part, check in to the cabin and then head up to the North Rim. We did this, and set off. We rose still steadily higher, and the temperature began to drop further to 7.5 degrees, getting pretty chilly. We rode up to the entrance, and were chuffed to see it was a ‘Fee Free Day’, meaning that we didn’t have to pay anything to get in. We rode another 13 miles to the North Rim Lodge, and parked in the very busy car park, before heading off along a trail, which took us up over and above the Canyon. The Canyon itself took our breaths away, the sheer scale of it, heading off in both directions as far as the eye can see, and the height at which we were above the bottom (so far down you could not see it). We tried out various places just to drink it all in. We had decided to wait as close as we could to sunset before leaving again, but did not want to risk riding in complete darkness, because there were so many deer and buffalo, plus it’s not something we normally do. As I went off to find a drink, Paul stood in the lodge and spotted a statue, Barney the Donkey, whom it is apparently lucky to touch. Sitting by Barney was a guy that Paul chatted to called Wayne, who was interested in our story. It turned out, he told us very humbly that since September 2015, he had been walking across the United States. The job he had lined up had not worked out, so he said, he had time and thought why not? Although he had never intended to walk so far, he has walked from Chicago to Florida, and had walked to the Grand Canyon across the deserts of Utah. He pushes along a bicycle beside him, which is his mule carrying his worldly goods. After chatting Paul and I thought that there had seen something very different about Wayne, perhaps a calmness or stillness to him that most people don’t have- and his soul seemed to shine out of his eyes. The day had turned out to be fantastic in more ways than one. Today followed on from yesterday, in that the spectacular scenery continued. We must have been treated to 15 or more different landscapes, ever changing, and so obviously crafted by the works of nature. The air is pure, the winds are strong and high, the rivers winding, the canyons are deep and in total they combine to give an almost overwhelming amount of information to your brain. I feel lucky, and almost astounded to be here witnessing this. As we readied ourselves to leave this morning, taking our time as it was only 3 degrees Celsius on waking, a cowboy approached us and asked if we were taking Byway 12. This was because there had been some snowfall on the high ridges, where we had met his cows in the fog yesterday. Luckily, today we were headed in the other direction, towards Hanksville, and he told us that way would be fine. Of course we appreciated his warning, but even more so, when at a Hot Chocolate stop a guy rode past on a Triumph Tiger 800, then swiftly turned and raced in to start talking very excitedly to us. We had seen him, and what turned out to be his Father-in-Law, at Bryce Canyon yesterday. Paul recognised him by his flip-flops hanging on his luggage bags! Anyway, he hurriedly told us that he and Father-In-Law (who was French, over visiting) and he (Alex, originally from Holland, now living in San Francisco Bay) had found a place to camp last night, not far past where we stayed, having taken a dirt road to ensure they were up high, and above the river. Now, last night, from the comfort of our motel room we witnessed the most spectacular storm over the mountains, with torrential rain. This was the rain that everyone had been warning us about. Not good for Alex and Father-In-Law, who found their tents running with water and threatening to float off. They had just spent two hours this morning trying to ride the now almost unrideable dirt road, which had been virtually washed away. Luckily, said Alex he had thought at the last minute to add a shovel to his packing, which had come in very useful for digging the bikes out of the mud trenches they got into on the track. Luckily, they were both ok, and were looking forward to a great breakfast. Later in the day, we were lucky enough to spot the Natural Bridges National Park, and took the 9 mile loop to the various viewing outlooks, to see the three bridges which are entirely created by nature. 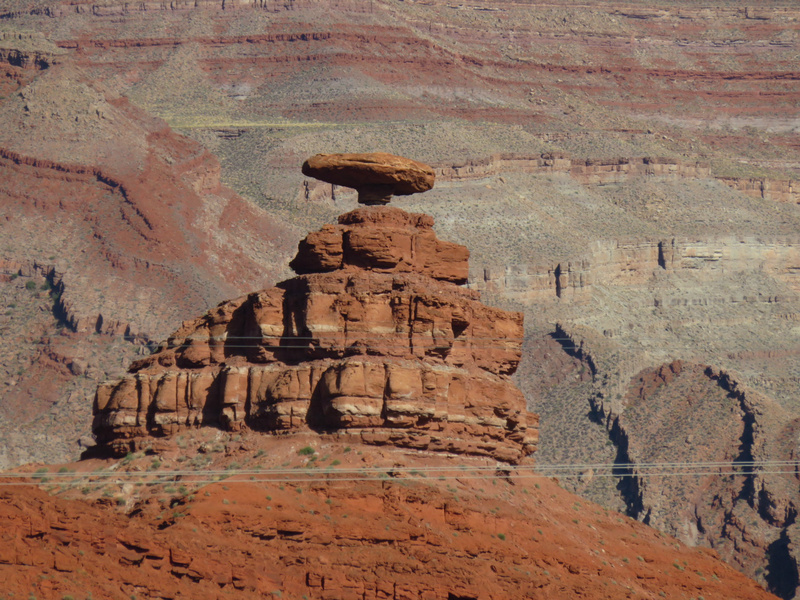 This was topped off by a gravel road, swiftly making our descent down into Valley of the Gods, before arriving at our destination Mexican Hat. The town is so called because just before it there is a rock formation which looks exactly like a Mexican Hat. We are staying tonight at San Juan Inn, a Navajo Indian run establishment, which is spectacularly set by the side of the beautiful San Juan river. It has been one of those days that completely exceeded our expectations. This was mainly due to the cold weather front that was all across Utah, Arizona and Nevada, apparently the tail end of a hurricane. 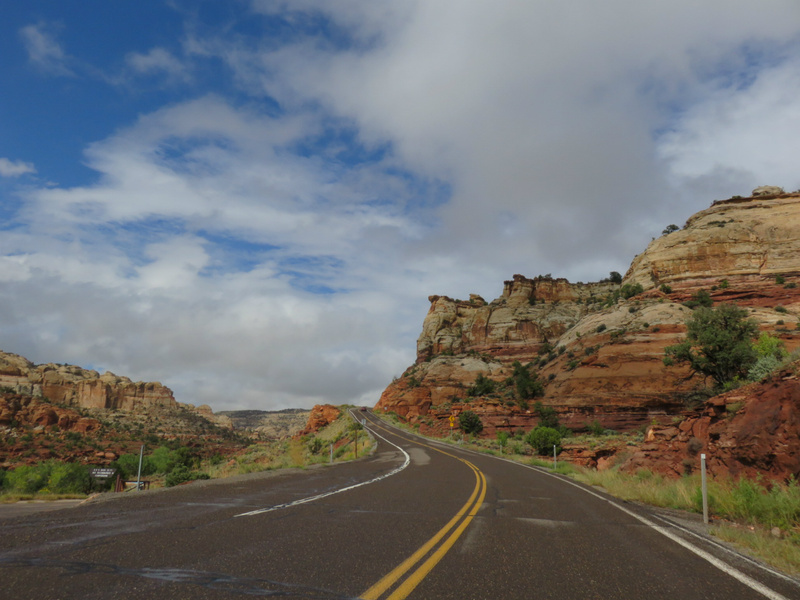 We left Cedar City, and took Highway 14 through roads that were immediately stunning, taking us winding through autumnal trees as we climbed higher and higher. Within, 20 minutes we were in thick fog as we cruised up to the summit, and the temperature had plummeted right down to 6 degrees Celsius. Very chilly indeed, and sadly not a lot to see. However, as we climbed back down, and finally reached our turn off the temperature had begun to rise again. We stopped to warm ourselves with Hot Chocolate before heading on to Scenic Byway, All-American Road number 12, which was our route to Bryce Canyon. Bryce Canyon was another chilly experience, a little misty, but still thoroughly enjoyable, to stop and take in the stunning views over the 18 mile long collection of amphitheatres, ending in a huge semi-circular viewing platform It has very distinctive structure caused by frost weathering and stream erosion of the river and lake bed. 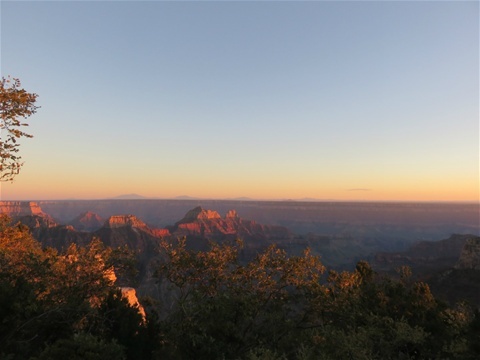 The rim of the Canyon is as high as 9,000 feet in places. After the visit, we stopped for fuel and a spot of lunch and Paul told me we would be using Highway 12 to make our way to Torrey, our stop for tonight. It was about 110 miles away, and as it was so cold, I told him I was looking forward to getting there. Little did we know what awaited us on Highway 12. This road turned out to be the very best that we have ridden in our three months on the road. It was pretty good along to a place called Escalante, 46 miles on from Bryce Canyon. Escalante is home to a National Monument called the Grand Staircase. We stopped to stretch our legs here, and a guy on a Yamaha Super Tenere pulled alongside to ask if we would be riding the Hell’s Backbone. He told us it was a dirt road, so sadly, no, as we’re trying to preserve wear and tear on the bike, which was a bit disappointing. Our disappointment soon disappeared though as shortly after Escalante came the most spectacular scenery, corner after corner of great roads, lined with the most magnificent rock structures 360 degrees around us, and for as far as the eye could see. We climbed higher again, 8,000 feet and above, and just could not believe our eyes, with the breath-taking magnificence of it all. Interestingly, when we arrived at the Broken Spur Inn, our stop for the night, when Paul checked in and told the Manager we had come on Highway 12, he seemed surprised. We think it’s probably a well kept secret by the Utahns.